The crowds start to gather for the Open Day. Today was our first Open Day of the season at the Ness, and what a day it was. To everyone’s surprise the Orkney weather played ball and, although cool, the day was bright and dry. And the people poured in. Our best estimate is that at least 750 people turned up to see this remarkable site and to be guided through its mysteries by teams of greeters and guides. 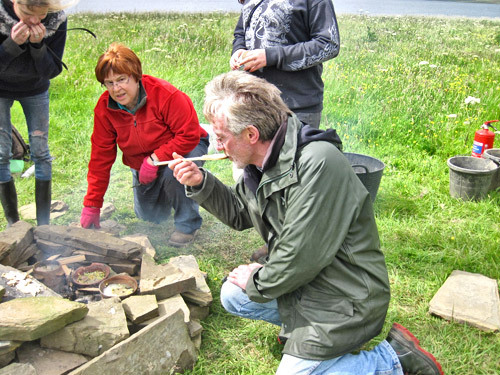 Large numbers clustered round the demonstrations of pigment-making and stone-working, cooking in Neolithic vessels and flint-knapping. 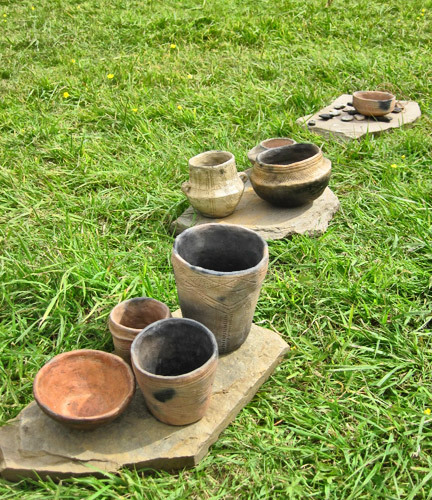 An array of Neolithic pots created by Mike Copper and used for the creation of today’s culinary delight. Chris Gee shows the crowd how stone was decorated and pigments created. 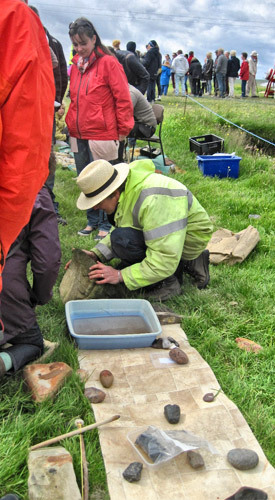 Hugo, one of our site supervisors and aerial photographer par excellence, also exhibited his flint-knapping skills. Alice and Owain start to disentangle wall lines emerging in the Central Midden Area. The official seal of approval for today’s Neolithic feast from excavation director, Nick. 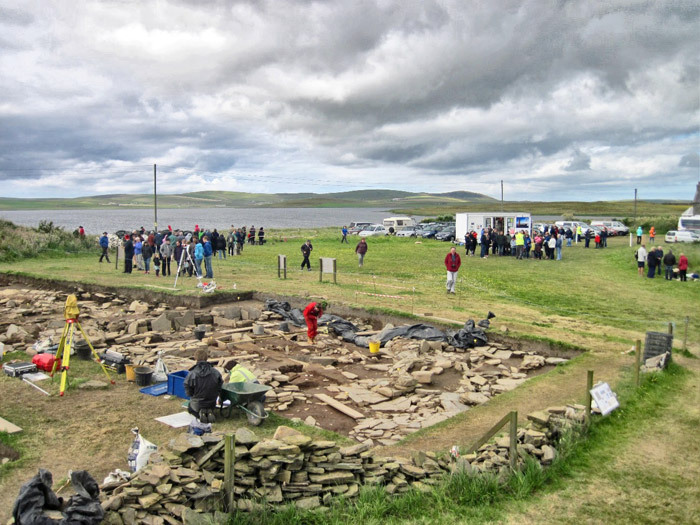 Other activities took place at the nearby Stenness Hall, and, through it all, the diggers worked on steadily — although some must have felt a bit like being in a goldfish bowl. Finds appeared regularly, including flint, stone and pottery, and the survey team of Mark and Beth continued to zap things of interest with lasers and machines which bleeped noisily. The on-site shop was crowded throughout the day and our excellent new guidebook (available on site, on the internet and at good bookshops) sold like very hot cakes. The really good news is that we have another Open Day still to come. Those of you in Orkney, or those planning to come, should put August 23 in your diary. From 11 am to 4pm, on that day, the site will once again be open to all and sundry, with associated happenings. Meanwhile, normal site tours start again tomorrow at 11am, 1pm and 3pm. Tomorrow, we are back to normal. See you then. Spot the red dots of applied colour on this pebble-tool. While excavating in a side recess in Structure One, Dan discovered a rounded beach pebble – not very remarkable on first viewing, However, when given a very light clean it revealed several small, but well-defined, red spots on its surface that, under close scrutiny, were indeed applied colour! This is a find more at home to the later Iron Age — a proto Pictish painted pebble?